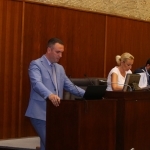 On the occasion of the Second Launch Conference of the INTERREG IPA Cross-border Cooperation Programme Croatia – Serbia, which was organised to mark the beginning of the implementation of the selected projects, a number of Subsidy Contracts from the First Call for Proposals was signed. The total budget of the contracted projects amount to EUR 7.6 million. Out of 127 applications, the Joint Monitoring Committee selected 24 projects of a total budget higher than EUR 18 million. During the Conference, the opening words were given by Ms Kristina Bilic, Assistant to Minister, the Ministry of Regional Development and EU Funds of the Republic of Croatia; Ms Stella Arneri, Acting Director, the Agency for Regional Development of the Republic of Croatia; Mr Mihajlo Dasic, representative of the Republic of Serbia, and Mr Ognjen Bijelic, Provincial Secretary for Regional Development, Interregional Cooperation and Local Self-government, the Autonomous Province of Vojvodina. The Programme and selected projects were presented by Ms Olja Georis, Assistant Director, the Agency for Regional Development of the Republic of Croatia. The Conference was attended by about 130 representatives of project partners. The Second Call For Proposals was announced for the beginning of 2018.